Why, yes. That is Corey from Florida Beer out front! Because you all have been hanging on my every word for the last week or so, you know I attended a Craft Beer Dinner at 5 Napkin Burger last night, featuring Florida Beer Company's lineup. My date for the night was Ed Roberts, and despite a rainy, not-so-short commute, we showed up a few minutes early. Go figure, on time in South Beach! 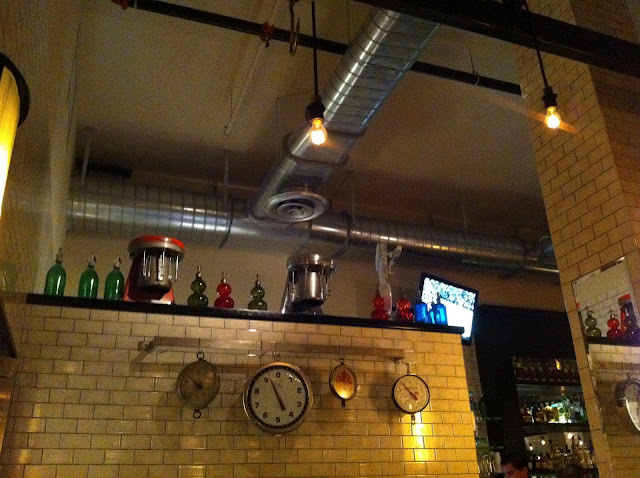 After rubbing elbows with the restaurant and brewery brass for 10 or 15 minutes, we were seated with the other guests. It was an intimate crowd, so it was easy to communicate with everyone there. General Manager Carlos welcomed everyone, introduced himself and his staff, and told us a little about the dinner we were about to eat. He then turned the floor over to Corey from Florida Beer Company. Shockingly, this was the first time I'd ever met Corey, after all these years. And Carlos sat down with Ed and I for the evening. Nice company. Corey introduced craft beer in general and set some expectations for how his beers would complement the different courses. He explained how the beers would either play off similar flavors in the food or contrast them and set them apart. That's when glasses of Key West Southernmost Wheat were served. Alongside Southernmost Wheat, four different appetizers were offered. 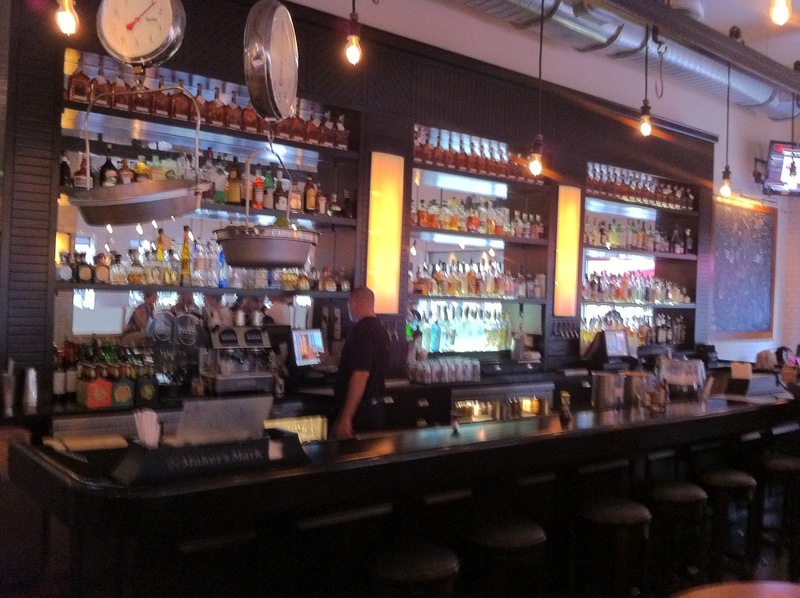 For me, the Pickles and Pastrami offering was the most interesting and definitely had the best flavors. 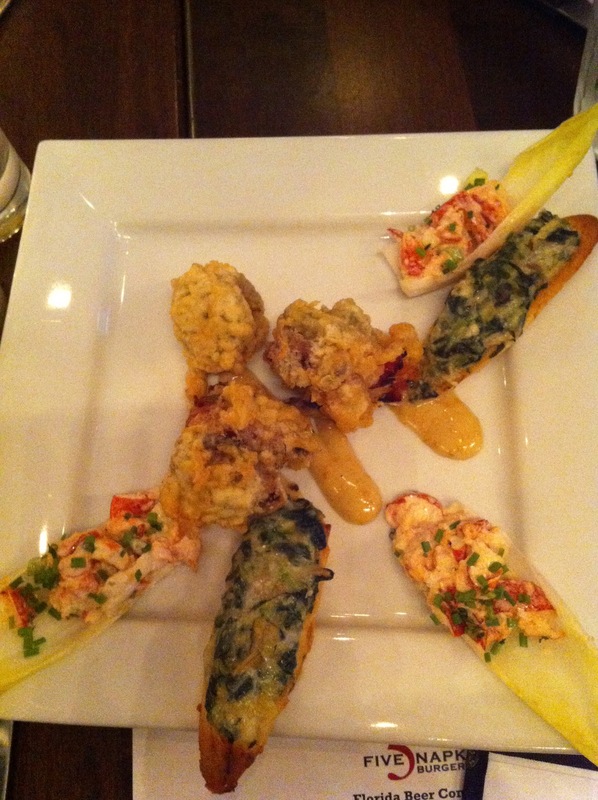 I also enjoyed the lobster and endives. The Pork Taquitos and Spinach on Crostini were also very good. Wow! I better pace myself for the real three courses, right? Next up. 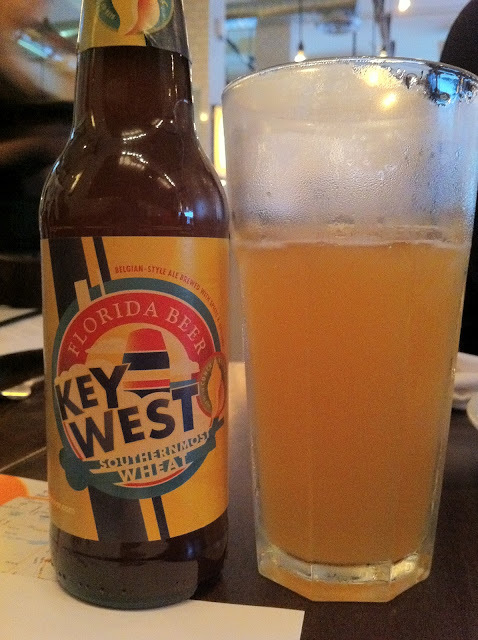 Key West Sunset Ale paired with Bacon, Ale and Gruyere Soup also made with the same beer. This was one of the most popular pairings of the evening. Carlos also seemed to really enjoy the way the Sunset Ale worked in the actual cooking of the meal, how the malty sweetness took some of the bitter edge off of the Gruyere. 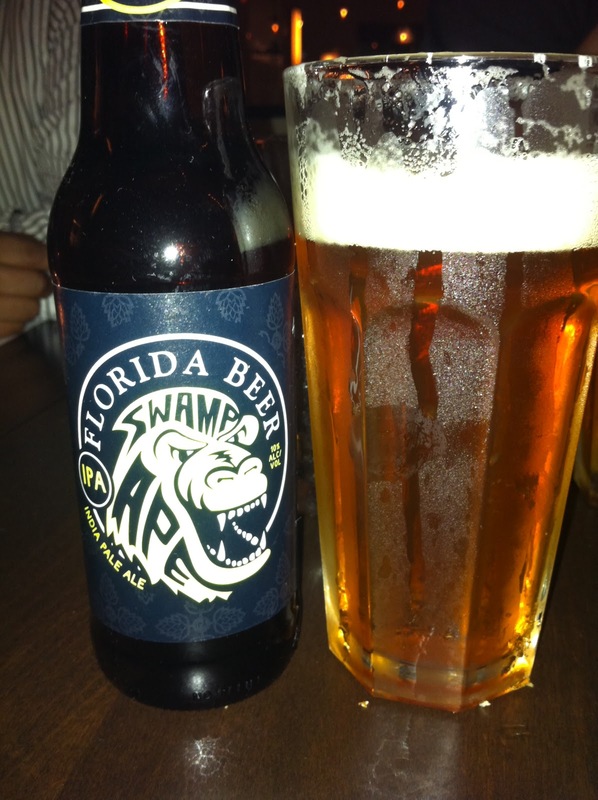 And he also let everyone know that moving forward, that soup would be made with this beer from Florida Beer. Hello Florida Lager. This beer was paired with either their Avocado Ranch Burger or their Veggie Burger. 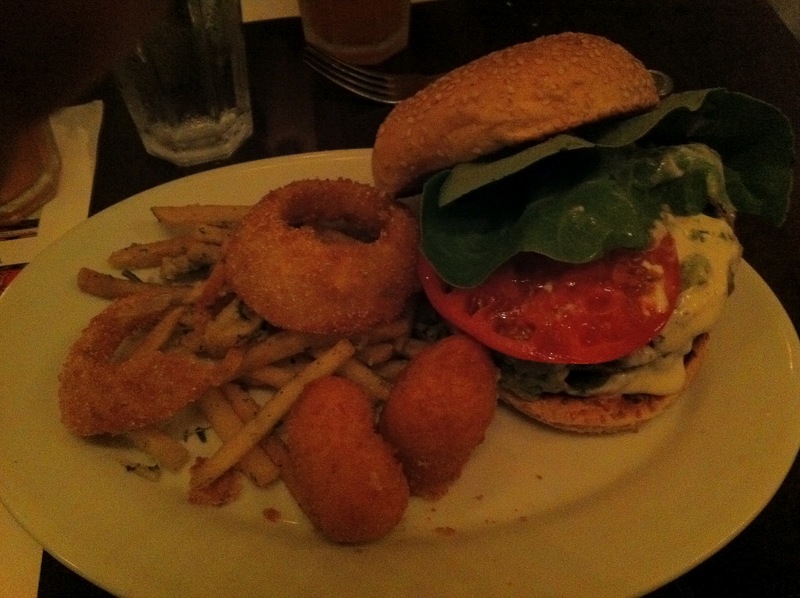 Carlos told us that the Avocado Ranch Burger was their best seller, so it was a no-brainer to order that one. He also let us know about how Chef Andy D'Amico came to start the 5 Napkin Burger restaurants. Apparently, his fine French restaurant in New York started offering a burger. 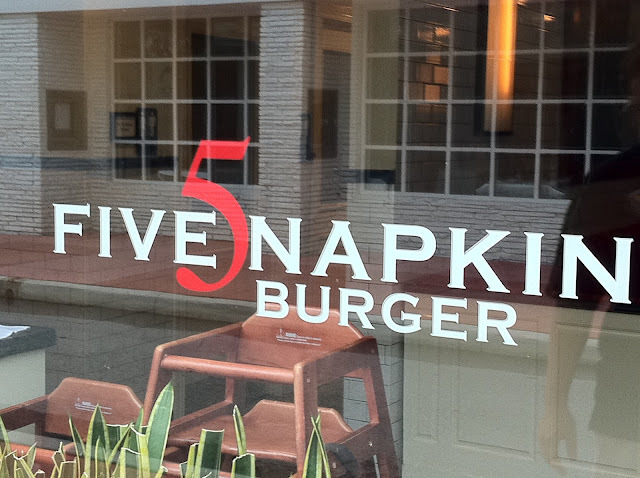 Not just any burger, one that was so popular that it inspired and named the new 5 Napkin Burger restaurant. 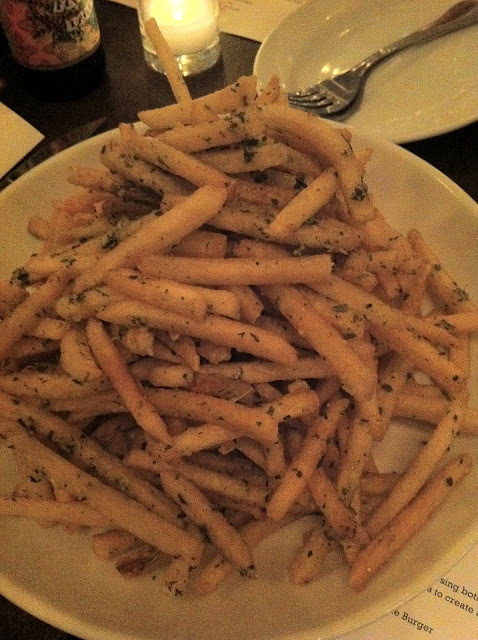 Before the burgers were served, we were shocked to see multiple side dishes. Fries, spiced fries, onion rings, and these really cool tater tots with mashed potatoes inside. ALL. PILED. HIGH. As we sat in awe, our beautiful burgers arrived. Lots of guacamole too, mmm. Honestly, I've never heard so many people order medium-rare, but I must say those people seemed really satisfied. Maybe next time! I finished my burger, but I think many of the guests were absolutely stuffed by then, including myself. Mood lighting was on. Sorry it's a little dark. Dessert was next, an awesome creme brulee paired with an equally awesome Swamp Ape IPA. I thought the food and beer matched up well, though I can see how some may have thought it was a little different than the other pairings. 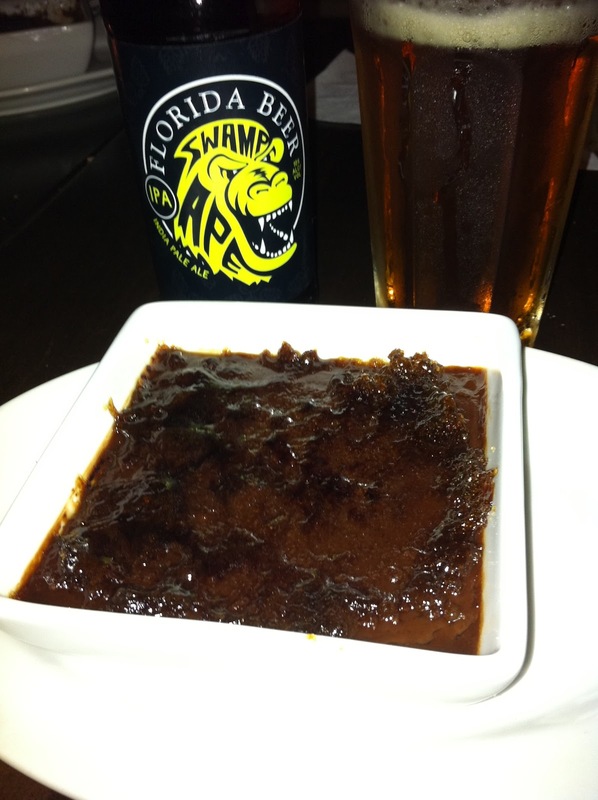 For me, the crunchy top to the creme brulee was so nice with the high alcohol of the beer. Swamp Ape is sweet but has enough hoppiness to make those bitter elements pop against a sweet dessert. After all the food was served, Carlos had Chef David come out and say hello. Was a nice touch. Corey was looking for favorite beers and pairings for the night. 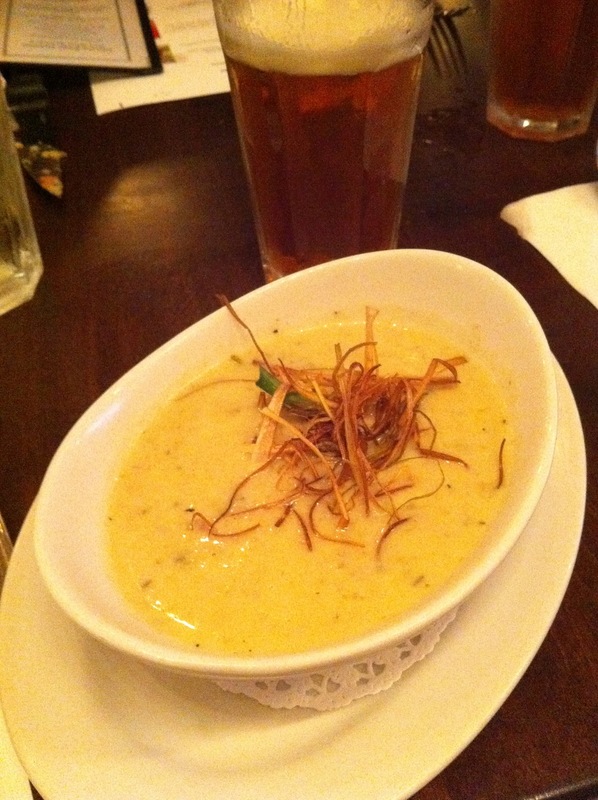 I heard several people say the soup while others mentioned the dessert. For me, I liked the other two pairings better, the appetizers and burger. 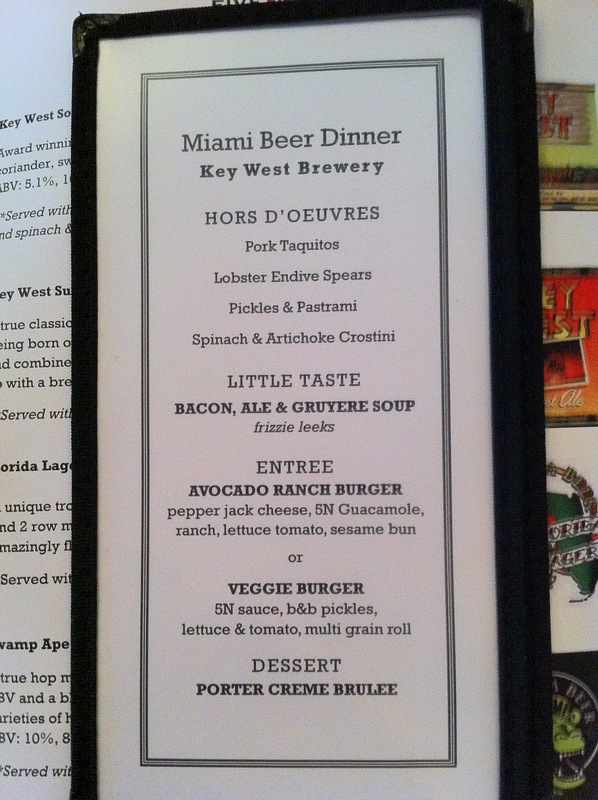 I remembered the beers better than the last time I had them, and I think they all were great with the paired food. If you're not convinced by now, you probably were just skimming this article. However, I think what you should do right now is sign up for next week's beer dinner featuring Holy Mackerel Beers. I'm sure you won't be let down! On the way out, we were given a Florida Beer pint glass. My wife was thrilled with that. Perhaps I'll save it for my first glass of Bermuda Triangle (Devil's Triangle) IPA, the newest beer that Florida Beer is working on! Here are some additional pictures. Enjoy.